Submitted by sanjay on Fri, 30 Nov 2018 - 01:31 pm. 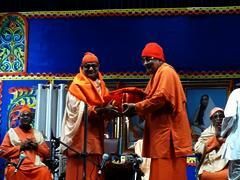 The Association also participated in the farewell function of Swami Jnanlokanandaji Maharaj. Sri Debasis Chatterjee, ex student of 1980 Batch and presently English teacher at Vidyapith represented the Association and respected Maharaj was gifted with a Shawal and Flower Bouquet as mark of respect. Sri Apurba Saha, ex student of 1988 Batch represented the Association and greeted Swami Sivapradanandaji Maharaj with a Shawal and Flower bouquet.